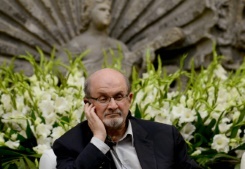 Gypsy Scholar: Rushdie Speaks Out! More than a quarter century after being slapped with a fatwa from Iran calling for his murder over his book "The Satanic Verses", Salman Rushdie says the world has learned the "wrong lessons" about freedom of expression . . . . Rushdie said some writers and other people were too cowed to talk freely about Islam . . . . "Instead of concluding we need to oppose these attacks on freedom of expression, we believed we should calm . . . [Muslims] through compromises and ceding," . . . . [which are] "politically correct" positions . . . motivated by fear . . . . "If people weren't being killed right now, if bombs and Kalashnikovs weren't speaking today, the debate would be very different. Fear is being disguised as respect . . . . Extremism constitutes an attack against the Western world as much as against Muslims themselves . . . . Keeping silent does not help Muslims." And that's why I speak up. Two more messages from Anonymous? Not so much. Humidity makes the heat seem worse. Do you mean "gendered"? I'm told it's a social construct. But what do these have to do with Rushdie? Faustino 1 for a friend . . .